I came across this recipe a while back and recently came upon some leeks and totally had to try it. I had never had leeks before, so I wasn't sure what I was getting into. I found though that I love leeks! They are kind of like green onions, but with more of the consistency of regular onions. They are really great when sauted with butter! This pizza was a-ma-zing and I am labeling it one of my favorites. The potatoes kind of make it hearty, and the leeks and bacon give it great flavor. I found that I needed to add a little more salt to my potatoes, but other than that, it was perfect! **Please note that I halved this recipe because I did a smaller pizza, but I am including the full recipe below. Prepare the pizza crust by drizzling lightly with olive oil and sprinkling lightly with salt. In a skillet over medium heat, fry the bacon until cooked but not crisp, then remove and set aside. Pour off most of the grease, but do not clean the skillet. Return it to the stove and, over medium-low heat, saute the leeks until soft, about 3 minutes. Remove the leeks from the heat and set aside. Using a sharp knife or mandoline, slice the potatoes very thin. Be careful not to allow them enough time to oxidize. 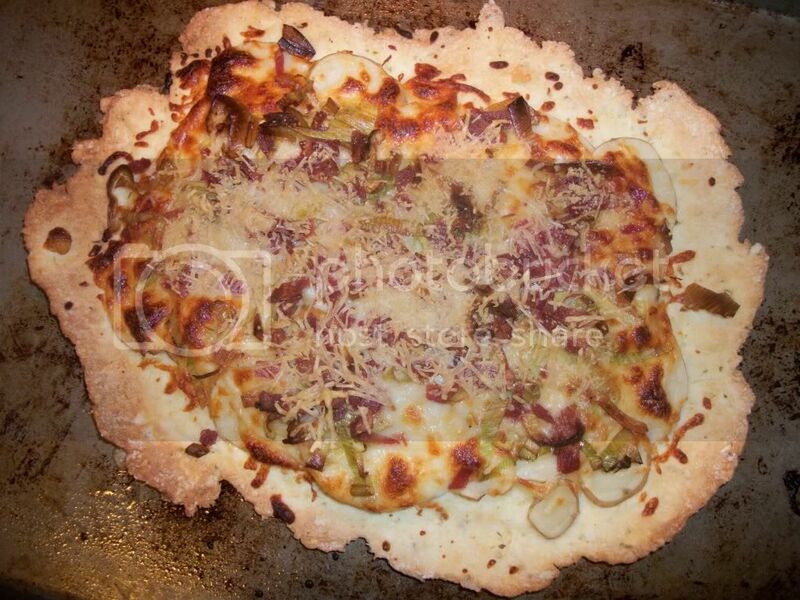 Arrange the potatoes in a single layer all over the crust, slightly overlapping the edges. Sprinkle the potatoes lightly with salt, then lay the mozzarella slices in a single layer on top of the potatoes. Place the leeks on top of the cheese, then sprinkle the fried bacon pieces over the top. Add a generous dose of crumbled goat cheese, grated Parmesan, and a sprinkle of pepper. 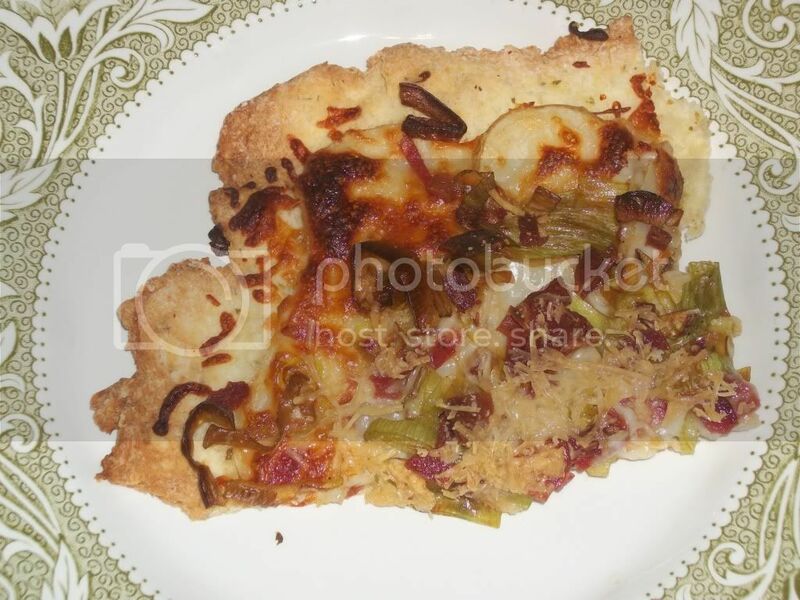 In an oven preheated to 500 degrees F, bake the pie for 8-11 minutes (or follow the directions on your pizza crust mix), until the edges of the crust are golden brown and the cheese is melted and bubbly. Slice it into wedges or squares and serve immediately. Yum - homemade pizzas are always a favorite in my book!